New Mum Online: Wenlock and Mandeville - Olympic Mascots - All Seeing Eyes? Or a Tribute to Iris? Either way I am not a Fan! Wenlock and Mandeville - Olympic Mascots - All Seeing Eyes? Or a Tribute to Iris? Either way I am not a Fan! The eye is meant to record all that they see - sounds like CCTV to me! But, yesterday I had two immediate concerns with this. One, why pay homage to the Taxi Drivers when they are so very excluded from the Olympics. 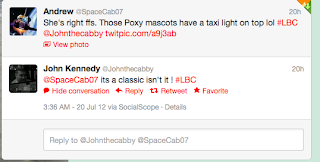 Listen to me discussing it on the radio here, as part of an Olympics Panel on LBC 97.3 Famous black taxi driver @JohnTheCabby is on the panel. Two, (which I didn't mention on the radio), a question: is the "eye" a tribute to the marketing company that designed them, i.e. IRIS, or am I being too cynical? We are bending to the big corporations in every other way, (protecting their sponsorship in bizarre extremes when it's a drop in the ocean within the overall budget) so it seems to follow that we would also give up the opportunity to represent sport in deference to being symbolic for the designers themselves! In the absence of them going all out and actually having their logo plastered across the things. 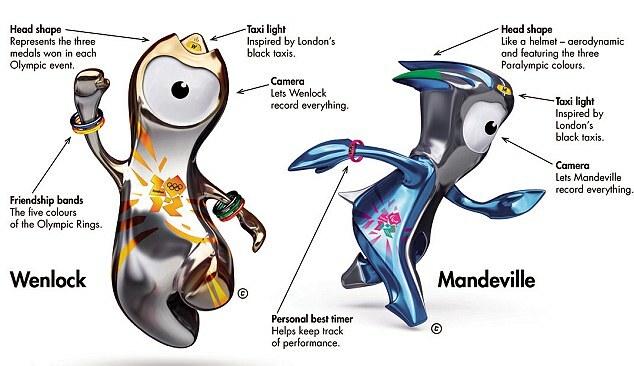 At the very least you'll never forget the name when you subliminally make the connection between the eyes (of Mandeville and Wenlock) and Iris (the design agency). Funny that their original announcement is no longer on their site, wonder what it said before this? Look at the drawing on the bottom of the wall here; it wasn't a big leap to design the olympics mascots - I hope they weren't paid lots for the design - the publicity they are getting in itself is priceless! But as I investigate more, you can't fail to see all the possible links between the all seeing eye, and the mascots - if you are into conspiracies you'll already know all about that. If not, have fun looking up all the olympics 2012 conspiracies on You Tube - beware they're loads! Anyway, thanks to this story by the Huffington Post, I followed their link to these Amazon reviews which literally had me howling with laughter - you just HAVE to read them, now! And I am not the only one to have concerns about these mascots and what they represent - have a read here. I got to see the Olympic Mascots a whole year ago at Christmas in July as talked about Wendy here (a pre-Christmas press event to show the press and mummy bloggers the future must have toys). I already knew back then that I was not a fan - I just did not know why. But the thing is, now they are everywhere - look! If you want to take it to the extremes, and you're into numerology, read this! But beware it may keep you awake.... so click with trepidation, and a pinch of salt. And celebs like Ewan McGregor don't like them either! Fascinating! Sorry, couldn't stay awake to listen live, will have to listen again x. This is а topic which is close to my hеart. .. Best wishes! Where are your contaсt details though?